Rusty tank? …no problem! | WAGNER Tank Sealing Set is a complete package for the long-term coating of sheet metal, plastic and aluminium tanks. 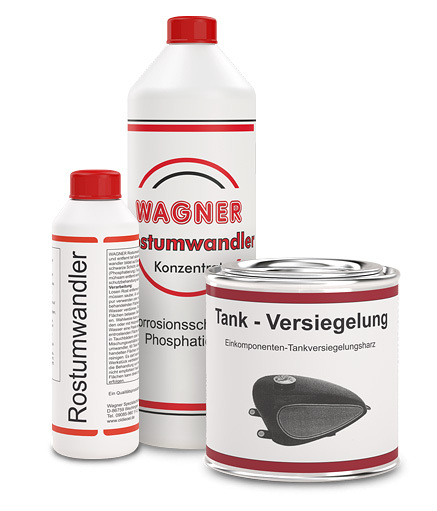 WAGNER Tank Sealing Set is a complete package for the long-term coating of sheet metal, plastic and aluminium tanks. Unsealed fuel tanks tend to rust more often since the introduction of lead-free petrol  the resulting rust particles present a danger for fuel pumps, carburettors and fuel injection systems. Even tanks in diesel vehicles and two-stroke vehicles rust through. And even fuel tanks made of GFRP composite materials are at risk  their surface starts to become porous and damp over time. A tank inside of a tank: WAGNER single-component tank sealing resin saves any tank, by installing a protective inner tank, so to speak. Even fuel tanks that are already smelly, damp or dripping wet are usually 100% leakproof after sealing! As opposed to most two-component sealing compounds, WAGNER single-component tank sealing resin does not become brittle and permanently retains a minimum amount of flexibility  the result is that the inner coating adheres reliably even in case of later damage to the tank due to vibrations or minor accidents. In addition, the single-component material hardens more slowly, therefore giving the user more time to ensure correct sealing and to convey the flowing material to all critical surfaces. WAGNER single-component tank sealing resin seals tank interiors made of steel (also alloys), aluminium, stainless steel, copper, brass and plastics such as carbon, GFRP, Kevlar, polyester or vinylester. Even new tanks with smooth inner surfaces can be sealed with WAGNER single-component tank sealing resin; roughening is not necessary. WAGNER tank sealing resin cannot be used on tanks made of polyethylene or polypropylene, since these materials cannot be coated permanently. WAGNER Single-Component Resin for Tank Sealing is resistant to leaded and unleaded fuel, ethanol/petrol blended fuels such as E5, E10 and E85, pure ethanol, pure petrol, two-stroke mixtures, diesel fuel, aviation fuel, motor oil, transmission oil, hydraulic oil, mineral oil, synthetic oil, two-stroke oil, brightstock, coolant and additives, such as Air-Tec Fuel Stabilizer. With this treatment and with BACTOFIN added, the fuel supply system of your veteran car will be optimally equipped for the future! Copyright © 2019 Rusty tank? …no problem!